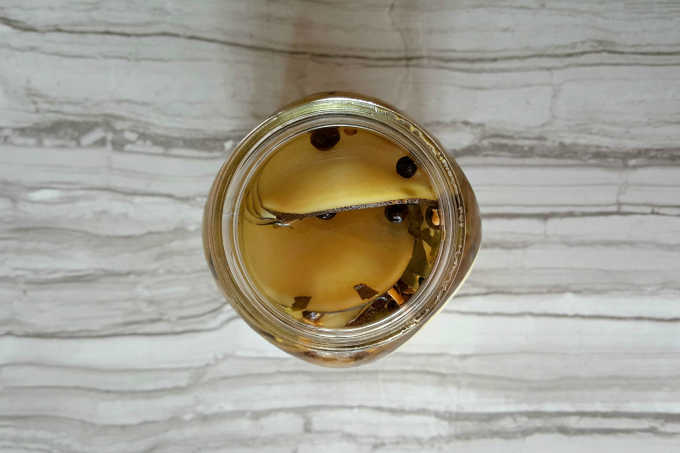 Black Radish Pickles are perfectly spicy for #SundaySupper Saving Summer Harvest. They have a sweet and spicy kick from the brine and delicious heat from the radishes. They capture the flavor of black radishes perfect for the summer season. Not that I’m really hoping summer will be over soon, but yeah. I hate heat. My genes are mainly Scandinavian. But, summer produce? Honestly, I want it to last forever. But that’s not realistic. So, what’s a food blogger to do? Head to the kitchen to figure out how to save summer in a jar, or a freezer, or a bag. I have been known to be up to my elbows in a bushel of peaches for canning. I’ve jammed and jellied my way through countless pounds of berries. And I’ve frozen more than my fair share of produce, too. However, I’ve never dried anything. We don’t have a dehydrator. I think that may be on the wish list for this Christmas. Pickle? Not really. I love picked okra, but okra’s not really cheap in these parts. I love pickled green beans, but just never felt the urge to get in the kitchen and make my own. And I LOVE pickles. But, for some reason, I’ve never made pickles. I have no excuse. I have the recipes from my mother and her mother, I think? So, heirloom recipes should be the perfect reason to make some pickles. But, my dear readers, I’m never one to make typical recipes. At least, I try not to make typical recipes. And these black radishes I get from the farmers market truly inspire me to make something different. These radishes spoke to me and asked me – no TOLD ME to make pickles with them. So, I did. And they’re definitely different, but good different. For those that have never had a black radish, take a regular radish and them mix it with some black pepper. These babies have the biggest kick of any radish I’ve ever eaten. They put spicy little red ones to shame. So, be prepared. Now, the brine is a typical quick pickle brine. It’s vinegar, water, sugar, and some herbs and spices. This recipes makes enough for one quart. For me that’s one maybe one and half black radishes. Because these suckers are HUGE! But, you could use any radish with this recipe. Just make sure you have enough to fill your quarter jar. These almost have a bread and butter pickle type taste due to the radish and the amount of sugar. I didn’t want them to be super sweet. I didn’t want them to be sour, I just wanted a little sweet, some spices, and some kick. Which is exactly what I got in this jar of pickles. Today, we’ve got canning, dehydrating, fermenting, freezing, and pickling going on today. The #SundaySupper crew has really stepped up and shown us how to preserve the delicious summer bounty this week! What’s your favorite way to preserve the flavor of summer? 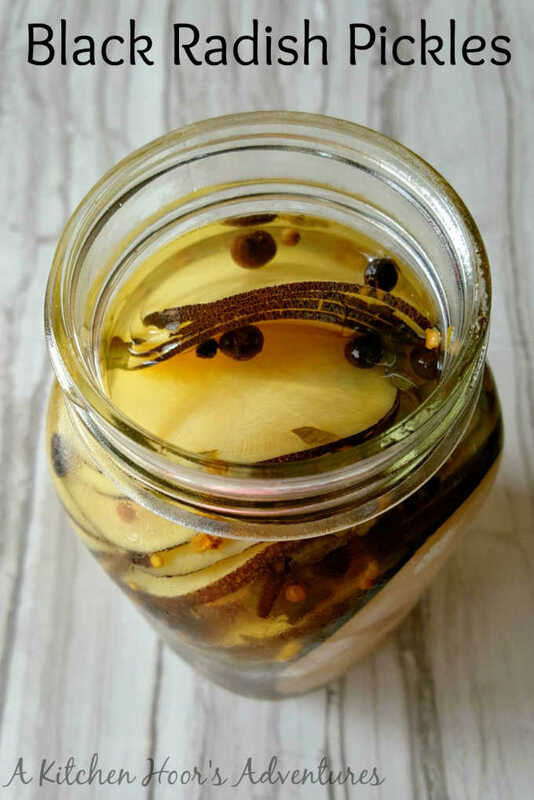 Black Radish Pickles have a sweet and spicy kick from the brine and delicious heat from the radishes. They capture the flavor of black radishes perfect for the summer season. To prepare the jar, bring a large pot of water to a boil. Carefully place the jar in the water and boil for 3 to 5 minutes. Add the ring and the seal and boil 2 to 3 minutes. Remove from heat and cool. Place the radish slices in the jar and set aside. Combine first 8 ingredients in a saucepan over medium-high heat. Bring to a boil and simmer until sugar dissolves; about 2 to 3 minutes. Pour the vinegar mixture over the radishes and place in the refrigerator. Refrigerate at least 2 days before serving. I’ve always wanted to try black radish! This looks delicious! Thank you! They’re really good. If you can find them, buy them! I never heard of black radishes. Something new to try and then pickle them! I couldn’t resist buying them either. Every time I see them at my fave stand I get them. So good! I have never even heard of black radishes. I will have to take a look next time I’m at the Farmer’s Market. They’re really good! Super spicy, but good! What a fantastic inspiration you had with the black radishes. I need to look for them at my local market. I think these would be great on or with so many things. Thank you! They really are versatile for many dishes and cuisines.